A firebug has woken inside my heart Dark times have fallen on remote Balrog County, and Mack Druneswald, a high school senior with a love of arson, is doing his best to deal. While his family is haunted by his mother’s recent death, Mack spends his nights roaming the countryside, looking for something new to burn. When he encounters Katrina, a college girl with her own baggage, Mack sets out on a path of pyromania the likes of which sleepy Balrog County has never seen before. 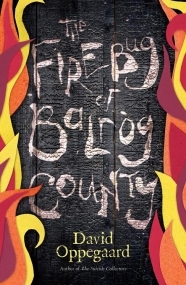 A darkly comic tour-de-force, The Firebug of Balrog County is about legend, small towns, and the fire that binds.